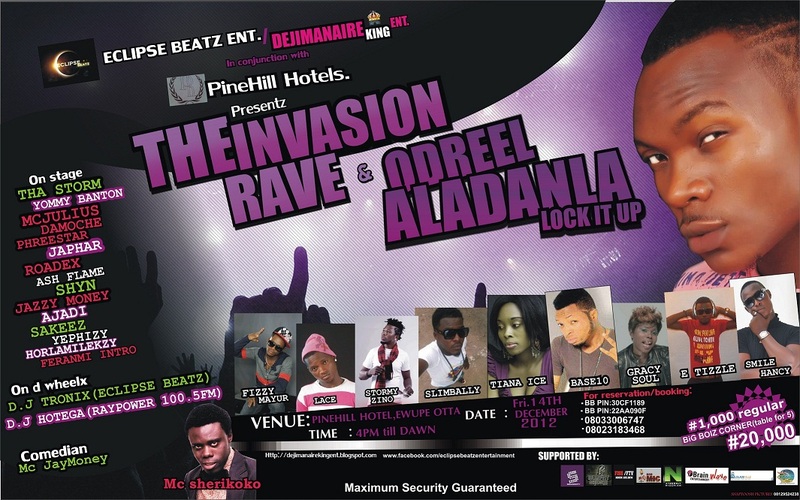 'The Invasion Rave & Odreel Aladanla' finally returns following the postponement on the earlier scheduled of Friday 8th June 2012. The event is now back with full force with slight adjustment and changes. The event is in joint partnership with a world class entertainment outfit called Eclipse Beatz Entertainment. The show promises to be one of its kind in Ota Ogun state. Below is the official poster of the event. The entire management of DEJIMANAIRE KING ENTERTAINMENT is proud to be in partnership with Eclipse Beatz Entertainment. Promises is been made to make the show a success. Eclipse Beatz Ent.| Dejimanaire King Ent. 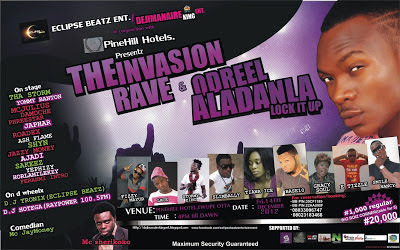 Venue: PineHill Hotel, ewupe Ota Ogun State. Date: Friday 14th Dec 2012 4:00pm till dawn. VISA: Regular N1000, Big Boiz corner N20,000 (Table for 5). First of it's kind in Ota. Be there or be squared.